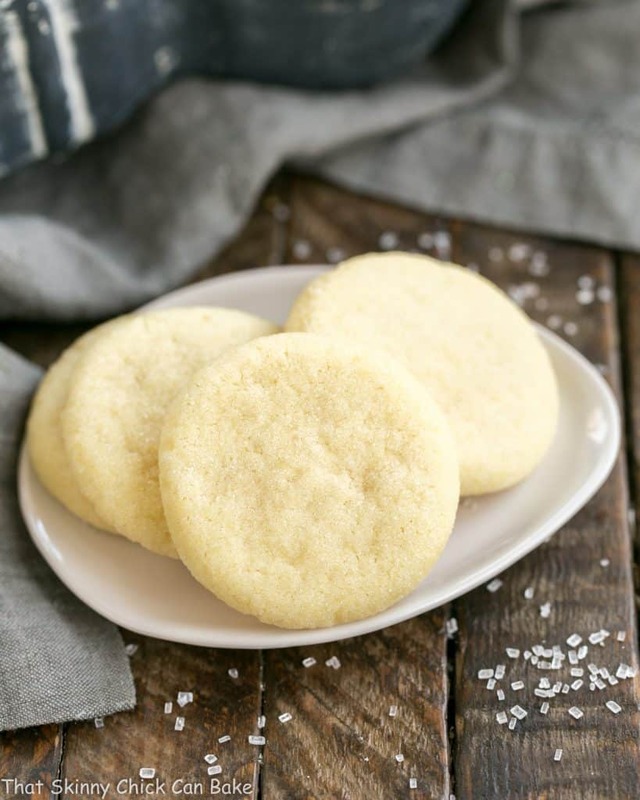 Old-Fashioned Amish Sugar Cookies are just what you need with your glass of milk! A perfect treat for any occasion. 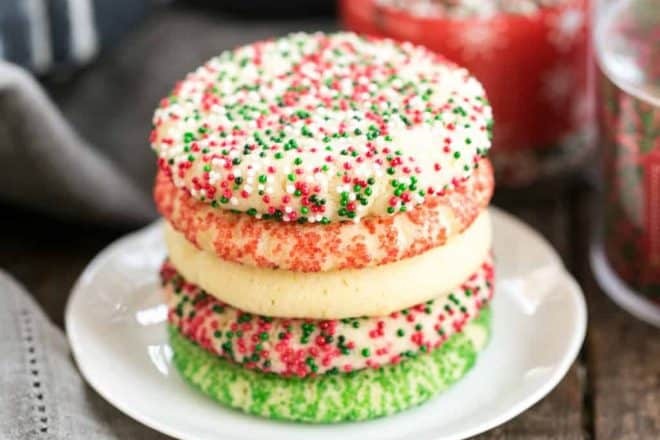 I decked out these melt in your mouth Amish sugar cookies in red and green sprinkles for the holidays, but they’re just as delicious rolled in simple granulated sugar or any kind of sprinkles your heart desires! 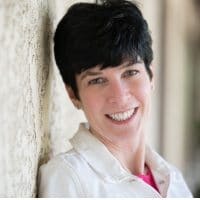 I shared a Facebook teaser a couple weeks ago: I’ve unearthed a closely guarded secret recipe for Helen Rudesill’s signature Amish Sugar Cookies. 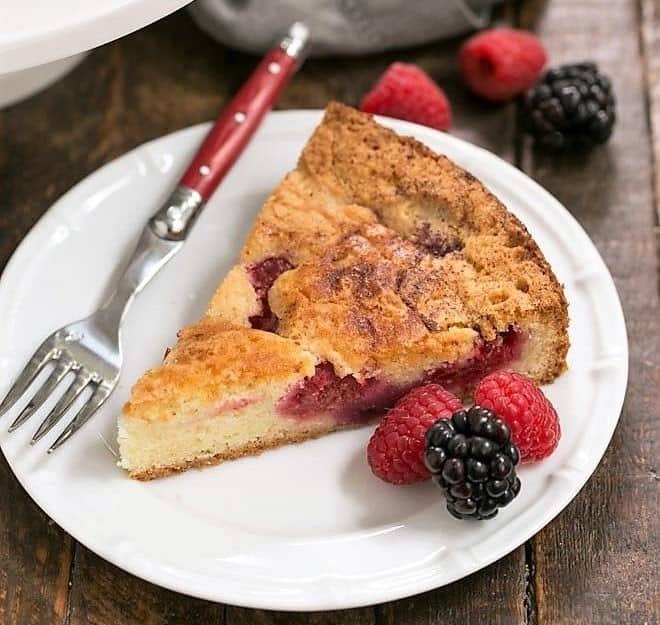 Stay tuned for the big reveal in a few weeks, but you can sample AND get the recipe by attending the Ensemble Music Society of Indianapolis‘ November 29 concert featuring the Escher String Quartet! A friend of mine had been on the hunt for this amazing, melt in your mouth old-fashioned Amish sugar cookie recipe for years. It was from an old church cookbook which is totally out of circulation. Through some sleuthing, she was able to obtain said recipe and use it to promote an upcoming concert. And in exchange for a little social media push, I was given the recipe to test! My family loves the classic, frosted, cut out sugar cookies for the holidays. These are just as delicious, but with a totally different texture. Not chewy like my frosted cookies, nor “short” like the classic shortbread cookies, but uniquely wonderful. Despite the lack of frosting, they got rave reviews from the troops. If you’re looking for a new, classic cookie to bake, give these Old-Fashioned Amish Sugar Cookies a try! 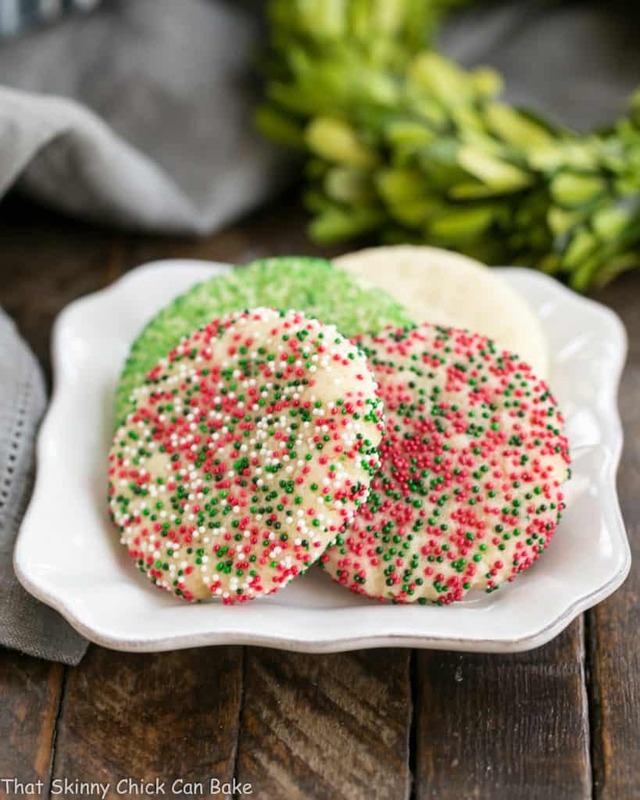 Besides butter, these old fashioned sugar cookies have a cup of oil as one of the ingredients. I used canola oil, but any mild vegetable oil would work. An overnight chilling helps the flavors meld and the gluten settle. Don’t try to bake them without chilling first. I used a Cookie Scoop so that all the cookies would be the same size, then rolled the dough into balls. I did not need to dip the glass into oil when I rolled the cookies in sprinkles, but definitely do that when pressing down on the plain cookies. Find a flat bottomed glass to to the pressing. The key is to press the cookies just until the edges start to separate slightly. The plain ones above were pressed too thin. I had 5 dozen to practice on! Like with most of my cookies, I baked these on Half Sheet Pans lined with Parchment Paper Baking Sheets. 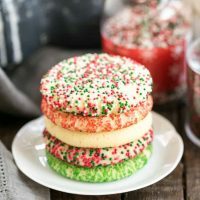 And for tips on how to make the classic roll out Christmas sugar cookies, check out this post on How to Make Sugar Cookies. These Amish Sugar Cookies are the comforting, delicious cookies your grandmother used to bake! Mix together the sugar, powdered sugar, butter and vegetable oil. Add eggs and vanilla and beat well. In another bowl, whisk together, the flour, baking soda, cream of tartar and salt. Slowly mix the dry ingredients into the sugar mixture until it’s all incorporated. Cover dough with plastic wrap and chill a few hours or overnight. To make, line baking sheets with parchment paper and preheat oven to 325º. Roll dough into 1-inch balls and place on baking sheets. With a flat bottom glass, first dip the glass in vegetable oil, then sugar before flattening each dough ball. Press down just until the edges separate slightly. Sprinkle tops with coarse sugar if desired. For more festive cookies, roll dough balls in colored sugar or sprinkles, press with a glass and bake as directed. So looking forward to trying my hand at your Amish wonders. Some how it seems the old time church cookbook authors got so many things right =) Wishing you and yours all the best this holiday season, Liz. They are so festive and beautiful with those colourful sprinkles! I love how you unearth vintage recipes Liz. These are a must try! I need sprinkles too, they make them look amazing. These are so bakery worthy ! love the colors! These cookies look delicious, the recipe and ingredients are very simple and easy to do it, can why to try it on my own, thanks for sharing this posts and also the photos are great. Wow, these look INCREDIBLE. 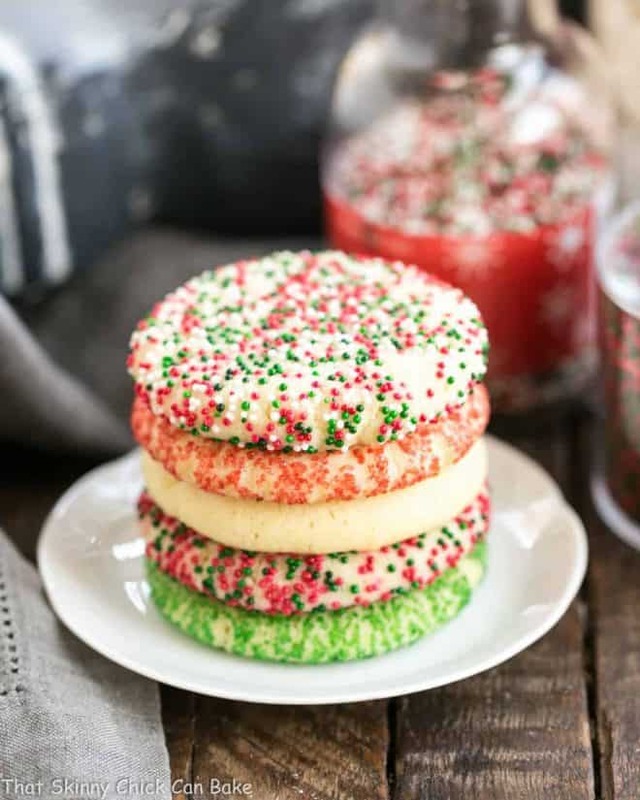 Sugar cookie season is my favorite season and I cannot wait to try these! Liz, thank you for this! These are so perfect! Not too complicated. I’ve just found my Christmas cookie baking project. Love these Liz, pinning and sharing! Heading to Amish country this weekend. Love these little cookies and hope I will spy some. But I’m so happy you’ve given me the recipe! These are so festive! I can’t say I’ve ever tried this type of sugar cookie, and they sound so unique in their own way. I’ll be putting it on the must-try list! So simple yet perfect ! Thank you Liz ! I love these cookies – so perfectly festive for the holidays! These are chillin’ in my fridge right now!! Can’t wait to bake and eat them! Cheers! These cookies look colorful and yum! Wow, butter and oil! I definitely have to make these. These not only look pretty, but sound like a delicious recipe to try too. 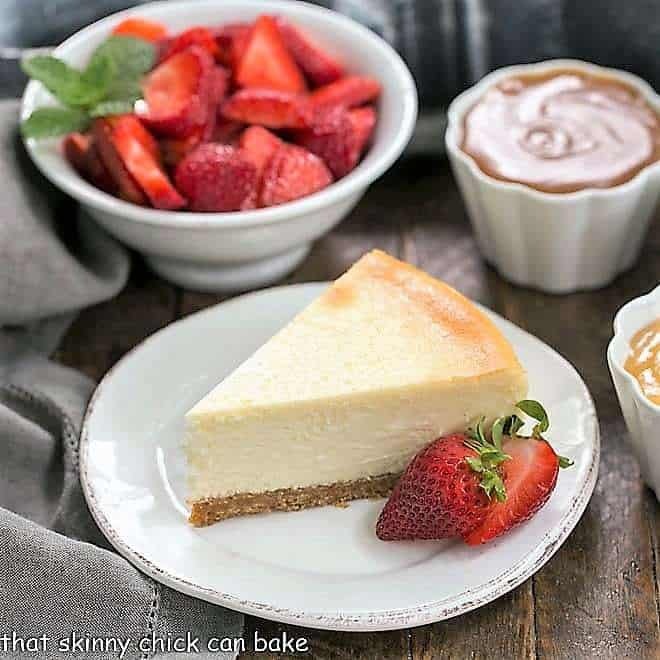 Thanks for sharing your recipe on Merry Monday. Pinned and will be one of my feature picks on the next party. Looks delish!!!! One question though. 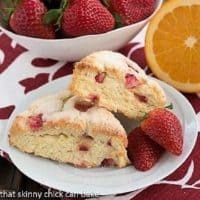 Can I use this recipe for cutout cookies? What prep did you change to get the cookies in the photo? Just pressing with a flat bottomed glass didn’t give me the same look. I rolled the dough between my two palms to get a well formed ball, then I rolled in the sprinkles. I didn’t need to oil the glass when the dough was covered in sprinkles, so I just pressed with the glass until they flattened. If yours cookies aren’t perfectly round when they come out of the oven, use a spatula to gently tap the edges into a better circle while they’re still hot. Also, they might flatten easier if you let the dough warm up just a bit at room temperature. I hope this helps! These made my kitchen smell just heavenly! You know when something that wonderful makes your house smell like your mom is baking in your kitchen you wont be disappointed! The only problem with the recipe…. I need to quadruple it, we just can’t stay out of them! These sugar cookies look amazing! 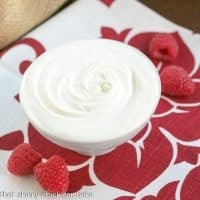 I can’t wait to make a couple batches and take them to our next get together! These cookies are absolutely perfect! These are on my rotation for sure! Sometimes the simplest recipes are the best- these look like melt in your mouth good cookies! These look so fun and festive! They’ll look gorgeous on a Christmas cookie platter! Love a good old-fashioned cookie – the simpler the better! I use vegetable and canola oil interchangeably, so you should be just fine! So glad you love these, too! Finally….I found the cookie recipe that’s been lost for almost 30 years! I’m not sure if the measurements are the same, but these cookies taste like the ones I miss so much! And i used the same punch bowl glass that my mom had to press the cookies down to make a bit of a star design on the cookie. These are SOOOO good I could eat the entire batch. Even if these are slightly overbaked (my last bit of dough made a tiny one), it’s just crispy deliciousness (is that a word?). These are just that good! 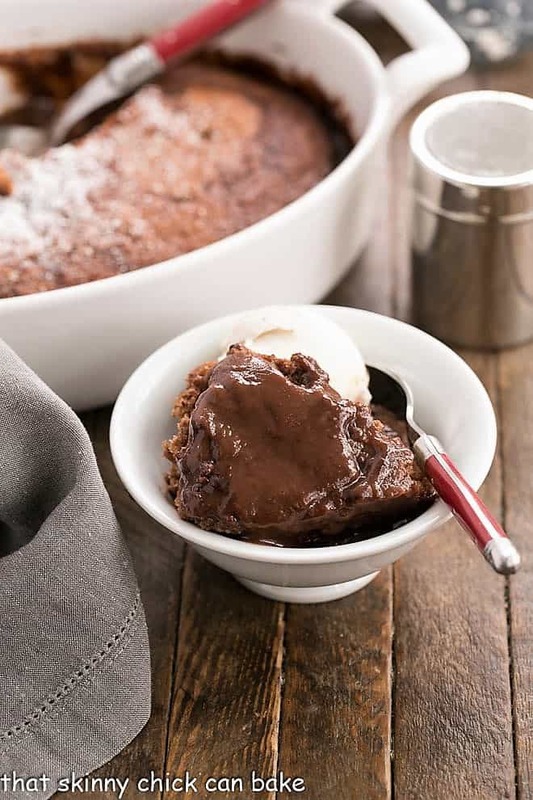 Thanks for reviving the memories of my teenage years with this recipe….I won’t lose it again! These bring back so many childhood memories of the holidays! So yummy! Holiday favorite in our house! These look like the PERFECT sugar cookies! I love how festive these cookies are! 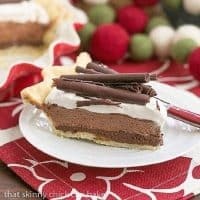 These are perfect holiday treats! My kids really enjoyed them! I wasn’t sure about this so did a little research. Since the raw sugar is coarser and more like brown sugar, the cookies probably won’t turn out the same. 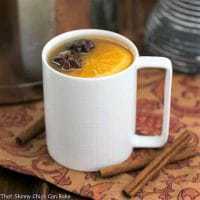 If you want to give it a try, one source recommends processing the sugar to make it finer (more like white granulated sugar) and adding a little water (a teaspoon or two—but I have no experience doing this!). A second source recommends using powdered sugar instead and weighing it to get a proper equivalent to granulated white sugar. Hope this gives you some guidance. Merry Christmas! We love making these for Christmas! So cute!! Made these for our Christmas party and they were a hit. Also they were so festive and colorful. Thanks for yet another great recipe. I’d pop the dough into the fridge and let it chill. Even put any dough balls in the refrigerator to let them chill before baking. Hope that helps, Melynda! These cookies look amazing. I love the way you’ve decorated them. Hello, Liz! These Amish cookies look so tempting, yum! I have one question, though. My daughter is allergic to eggs. Do you think I could substitute with baking powder and vinegar? Or what would you recommend? Thank you in advance! Oh, gosh, I wish I had an answer for you! I know there are all sorts of egg substitutes, but I’ve never tested any. If you’ve found one that works in cookies, I’d give it a try—-maybe just a half a recipe so you don’t waste the ingredients if it doesn’t work. Sorry I’m couldn’t be of more help! Good luck! Absolutely love the video, nicely done! These sugar cookies look so cute and delicious!